Lovely property and lovely owner, a great stay. Beautiful house with lots of character. Sylvie and Jean were both lovely and helpful. We had a peaceful and quiet, comfortable stay. Would highly recommend. Absolutely beautiful. Tastefully restored house. This is a beautiful house. It's very private. Set in beautiful grounds. Very handy for Carcassonne airport. Yet peacefully tucked away down a country lane. It's attached to the owners property yet not over looked. The pool is a good size and a gorgeous setting. We were only a party of 4 so gave us loads of space. The ping pong table is very good quality and in a barn for shade. Unfortunately we weren't too lucky with the weather but that's just bad luck. There was lots to do in the area. Jean Claude met us on our arrival. He was very welcoming. Sylvie called into see us later with her very good English and made us very welcome and gave us very good advice for where to go and what to see and best days to go places. It's a stunning area. Carcassonne is a lovely place to visit. Lac de la Cavayère near Carcassonne was pretty and a nice walk around the whole lake (It's a 5km circuit). There are lovely markets in the area and a week wasn't long enough to do the area justice. Thank you Sylvie, lovely host. Filou and Itoun (apologies if spelt wrongly), the dogs were very sweet and wandered in and out. The kids loved them being around, like a home from home for us. Thank you Faye for your kind words. You have been five star charming guests and I hope you will come back soon ! I would not hesitate to recommend this house to people: it provided everything we needed from well-equipped accommodation through to a good location for outings to various activities, both cultural and active. A minor downside was the lack of sun on the outside areas in the morning - possibly due to the growth of the trees over the summer - but this just encouraged us to do things in the morning and enjoy the property in the afternoon. And finally, as others have said, the owner Sylvie was welcoming and helpful, and her dog Filou loved to visit. We can only agree with what Paul S. said in his review of April 2015. Our party consisted of six adults and one child (aged three) and the size of the house meant that we could spread out and not be under each other's feet! The house itself was really charming and had all the facilities one required even though it's a very old building (but beautifully maintained). The grounds are extensive and well managed as is the large swimming pool a short walk from the house. The village is only about 20 minutes walk away (uphill going but downhill coming back!) and Filou made numerous appearances both in the gardens and on the journey to the village. The village itself has a good selection of small shops and there is an Intermarche just outside the village with a Carrefour in the town of Bram, about three miles away. Mustn't forget to mention Sylvie who was really helpful and who seemed to be on the go all the time. All in all a wonderful stay and would recommend it. 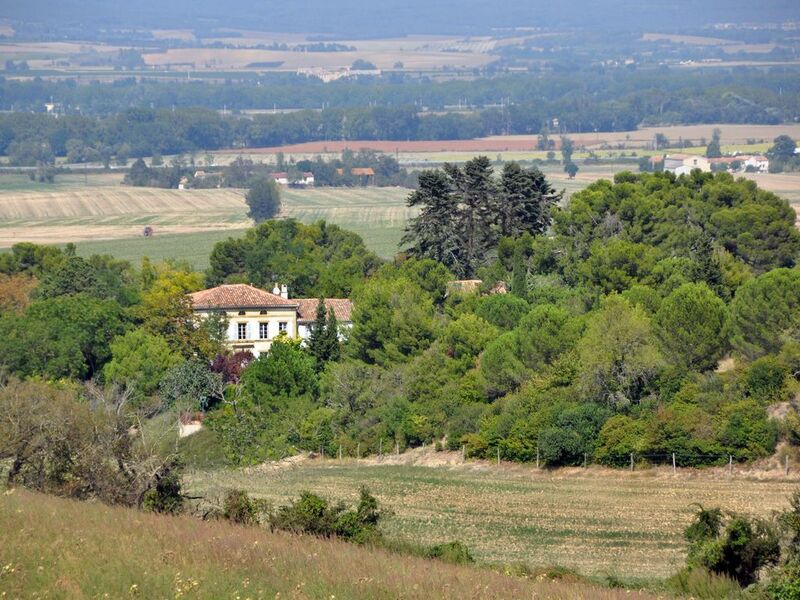 Built around the time Napoléon was being fitted for an unusual looking hat, this very lovely house adjoining an impressive domaine, has been most tastefully renovated by it's owner, the welcoming and highly helpful Sylvie. If a peaceful sojourn is required, you will find it here tucked neatly among beautiful trees, that very much allow for the sun on the terrace, but guarantee complete shelter from the wind (which any previous visitor to the South West will have experienced, and not just as a result of the garlic soufflé). We arrived with 5 potentially opinionated teenagers and a doctor, all of whom submitted reports that this was one of the best holidays we've had. Special mention should also go to our two new friends, Filou, and Brown Dog (we didn't catch her name) two local canine ambassadors who showed us the way home after a walk to Montreal, and were generally a delight. In short, having waffled, book a stay here if the South West is your chosen destination...within easy distance of Carcassonne, Mirepoix, the beach at Gruissan, and we even popped to Barcelona for a the day, I'm sure you'll have a lovely time to remember. Maison charmente dans cadre pastorale. Nous venons de passer 2 semaines de vacances magnifiques dans une maison ancienne mais de tout confort avec une grande cuisene parfaitement equipée. On a beaucoup apprécié le silence et le calme du domaine exceptionelle. La propriétaire est très accueillante, correcte, disponible et sympathique. Le chien Filou nous a accompagné lors de notre visite à pied (20 minutes) chemin valloné, le matin au boulanger et au café pour prendre notre petit noir matinale . Piscine vraiment superbe avec vue exceptionelle sur les champs. heureuse que vous ayez profite de votre sejour a tourreille!! au plaisir de vous revoir...filou vous attend pour vos balades champetres!! !